You've started your eBay business and it's going great. You've emptied out your attic, now what do you sell? 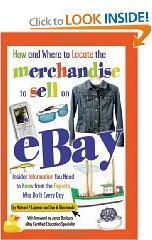 This book provides detailed insider information about how to find the best merchandise to sell on eBay and where to get it. Insider information you need to know from the experts who do it every day. Entrepreneurs in record numbers are setting up shop on eBay, according to a new survey conducted for eBay by ACNielsen Media Research International. More than 724,000 Americans report that eBay is their primary or secondary source of income. In addition to these professional eBay sellers, another 1.5 million individuals say they supplement their income by selling on eBay. In the last six months of 2005, eBay members in the United States sold merchandise worth approximately $10.6 billion. As you can see, finding the customers is not a problem locating quality items to sell, is the challenge. So what do you do when you are done cleaning out your closet and attics? Where do you find the merchandise you need to sell on eBay? That s precisely what this new book is about. This book show you where to find products that you can buy for a few cents on the dollar and resell for massive profits! This book is intended for online sellers who want to build a business that can be increased over time by selling primarily new merchandise in quantity. In short you will learn to become a product sourcing pro and make money on eBay with products including: clothing, mixed lots, electronics, tools, furniture, general mixed merchandise, domestics, housewares, antiques, books, shoes, jewelry, toys, gifts, sporting goods, hardware, and much more.